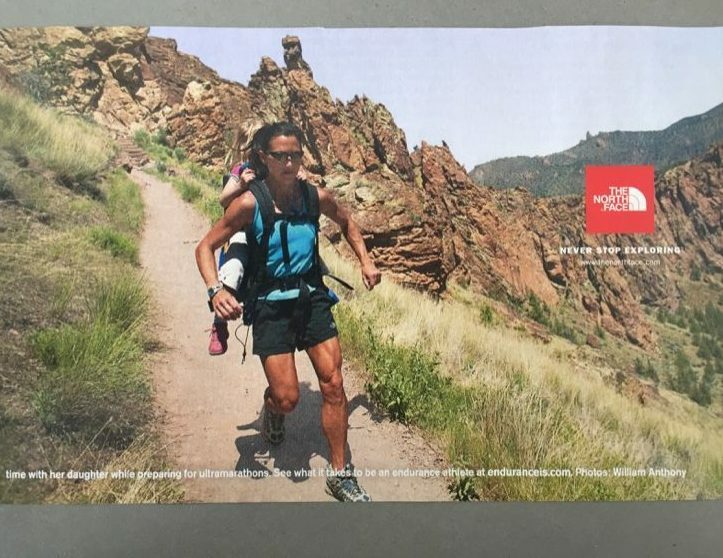 The North Face ad featuring Kami and her daughter. The turning point in Kami Semick’s ultrarunning career came in 2011, eight years after she ran her first 50k. Semick had been a cross-country runner at the University of Alabama, but she didn’t get the ultrarunning bug until her late 30s. She finished her first ultra at age 37, the Siskyou Out Back (SOB) 50k, second in 4:54. 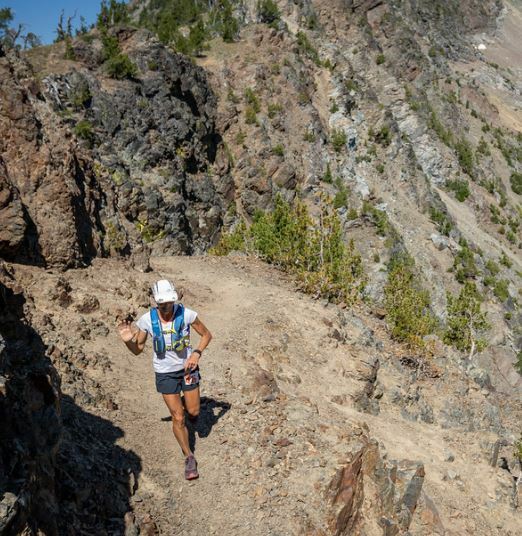 Her running resume includes numerous wins, including five at the Miwok 100K. She ran her first 100-miler, Western States, in 2006 and finished fourth. Four years later, she set a 100-mile PR at the Vermont 100 in 16:42, first female and third overall. She also ran road marathons, winning the 2008 Portland Marathon in 2:45:54, and raced internationally winning both the IAU 100K World Cup in Belgium and the IAU 50K World Championship in Gibraltar. In 2010, she placed fourth in Comrades in South Africa. In addition to twice earning UROY, she was named USATF’s Ultra Runner of the Year in 2009 and 2010. By 2011, Semick still ran at the top of the sport and was peaking physiologically—but midway through that year, she felt worn out and sensed she needed time off to rest. In addition to competing in two road marathons in early 2011, she had raced closely with rising star Ellie Greenwood in three epic races, three months apart: American River 50 (Ellie finishing first, Kami nine minutes behind in second), Comrades Marathon (Kami third, Ellie six minutes behind for fourth) and Western States 100 (Ellie first, Kami 22 minutes behind for second, their race to the finish infamously interrupted by encountering a mama bear and cubs on the trail; the following year, Greenwood set the still-standing course record of 16:47). In August 2011, Semick and her husband moved with their daughter to Hong Kong to work in technology. She intended to take at least a full season off from ultrarunning to give her body a break, but she discovered a vibrant ultrarunning community in Hong Kong and felt compelled to keep racing for her sponsor. While living in Hong Kong, Semick says she had some good races in the region, “but my highs were never that high, and my lows kept getting lower. Energetically, I just went downhill and dug myself into a hole. I felt cranky, achy and tired most of the time.” Blood tests revealed low thyroid function plus intestinal infections requiring multiple treatments with antibiotics. Semick then re-entered the West Coast ultra scene but that December, she ultimately confronted the reality at her worst-ever 50-miler that she needed and wanted a break from the sport. 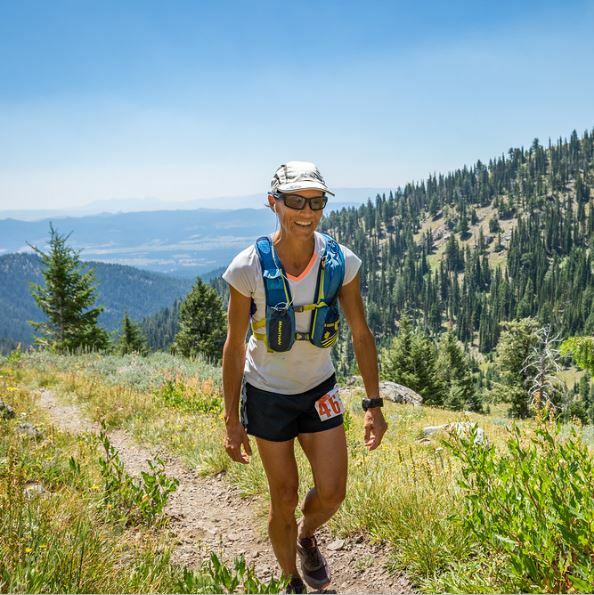 Not only did she disconnect from her sponsor, but she also resigned her position on the USATF’s mountain/ultra/trail board, and took the plunge into something else entirely: starting her own company called Food4All. Lift heavy weights. I wish I had done this in my 30s and 40s, as I think it would have made me more injury proof. For example, 5 times 5 sets of up to body weight for squats and deadlift, and working toward 50 to 75 percent of body weight for overhead press, bench press and row. Not only can I carry a lot of fresh groceries, but I also feel stronger later in my long runs. I find sleep to be elusive. Sometimes I get really hot and throw the blankets off, and then get really cool. What works for me on occasion is a micro dose of Indica THC tincture mixed in with CBD to help me sleep through the night. Thanks for the article, Sarah. Heading for 60 this year. And I kind of tittered at the last comment. No, not about CBD. A wide-awake-at-night person needs to do what they need to do. That’s about the only event at which I excel at this point: I am an Olympic calibre sleeper! But I know the struggle from others. I too wish I had weight trained earlier. Not up to the heavy weights Kami is throwing down; still, I feel the difference. Best to you, Kami. Enjoy hitting those heights. I’m so glad to hear Kami is back in the sport, with full smile and sense of adventure. She was/is a big inspiration to me, particularly juggling racing, motherhood, jobs, international living, farming…I wonder if she still does those sprints with a roped tire dragging behind her. Seeing her toddler go for a ride in her workout is still one of my favorite Kami stories. See you on the trails, Kami! Thanks Scott! It’s fun to flash back to mid- to late-2000s huh? I know you interviewed Kami for your blog way-back-when. I hope we cross paths again, if not in the Bay Area then Colorado! Thank you so much for this article! I always love hearing from women in the sport over 50. It’s a rare voice in the ultra community and yet a valuable one! My pet peeve is when women in their 30’s talk about “aging”, haha – just wait!! Anyway…great to hear Kami’s story and appreciate you seeking it out Sarah. See you in Sonoma! Thanks for the article Sarah. I am always inspired by runners at my age or older that are still at it and what keeps them going once speed starts to fade from the picture. It’s been great to see Kami back out on the trails again! She is still a Central Oregon legend! Wendy, I’ll never forget meeting you at that RRR100 aid station when I was crashing & falling asleep and you were going so strong. I hope we cross paths again! Really enjoyed this article. I was never the caliber runner of Kami, but I did OK. After a hysterectomy in my 50’s, everything changed, as did my results/expectations in my races. I’m now 60 yrs old, and still loving the races I do as much as ever, but there DEFINITELY are body/energy/hormone changes a woman needs to understand and deal with as she ages. Still fine tuning it all, but have made peace with being out there, doing my thing, and not defining my fulfillment with my “time” at the finish line. I’m running on the trails for the same reasons I did when I began 40 years ago — to feel the dirt under my feet, quiet the “noise” in my head, smell the flowers, literally, and enjoy the company of like souls. You go, Kami — welcome back. Enjoy your races for all the right reasons. People like that are my role models! I always wondered what Kami was up to all these years. I remember her strong running back in the early 2000’s. She was such am inspiration and I knew she’s be back at it in some way to keep on doing what she loved and was so good at! Great article Sarah! I had to laugh though when I read about a mama bear and cubs interrupting Ellie and Kami’s race to the finish when Ellie set the CR at Western States (I hadn’t know that!). What is it about mama bears and their cubs interrupting course record runs at Western?? First Ellie, then Jim. Too funny. I really enjoyed your article. I remember seeing Kami at races back in the early 2000’s and was always inspired by her. Once I hit my 50s, I too found I needed to change up my running training in order to stay pain-free and mentally motivated. Strength training, cross-training (bike, rowing, pickelball!) have been a welcome break from running. Still, there is nothing that puts a huge smile on my face like running through a lush green forest with feet kicking up dirt. I enjoyed the article especially when she mentioned weight training which I’ve stressed to women for years. Most are afraid it will make them bulky but it merely adds to your strength and protection from injury and if you do get injured you’re able to come back faster and stronger. Happy running Kemi and to all 50 plus runners, we still can do this! !